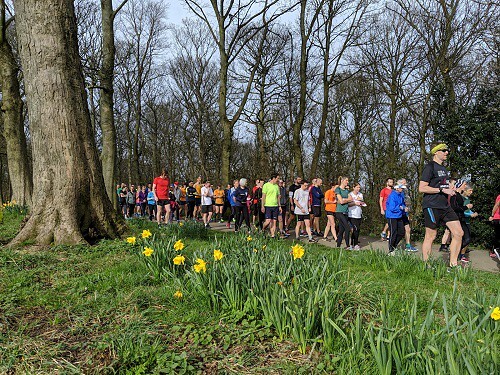 A total of 296 runners and walkers basked in the beautiful morning sunshine at Graves on Saturday. After a few weeks of changeable weather and the odd cancellation, it was lovely to see spring in full force. Jo briefed everyone and then we all walked past some beautiful daffodils to the start. 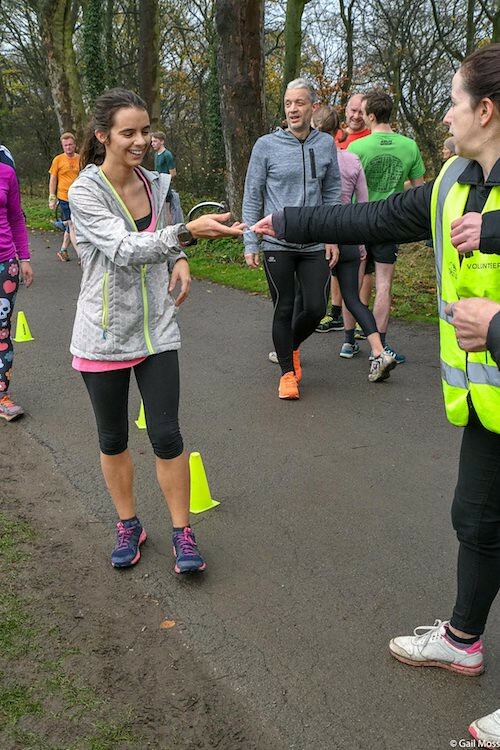 Join us again next week for more lovely parkrunning! Follow the ‘manage my profile’ link in your results e-mail, you will find an option to ‘opt in’ to the e-mails. Don’t forget that there is now a junior parkrun at Graves Park on a Sunday morning too. 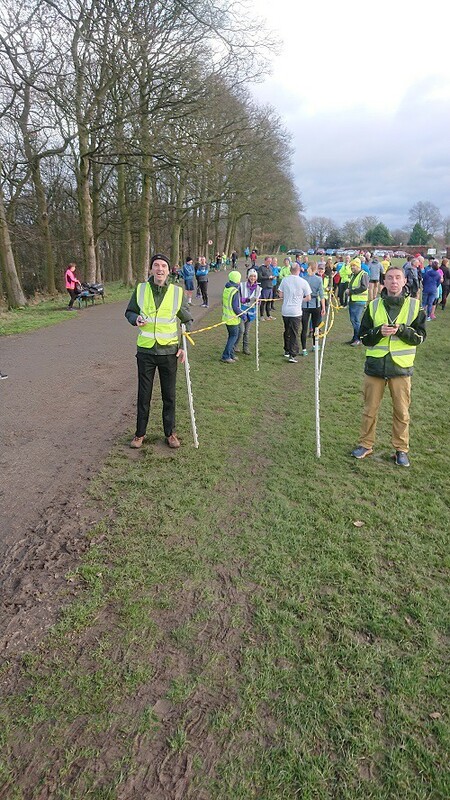 As usual, the event would not run anywhere near as well without the wonderful group of volunteers that Graves parkrun attracts. 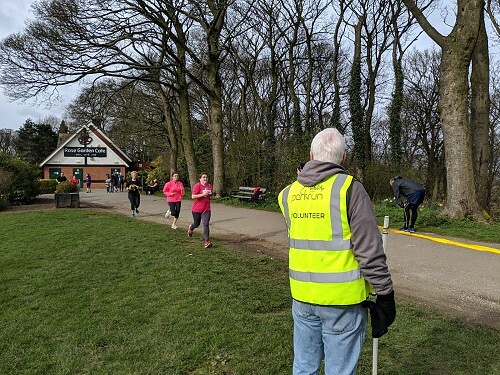 Please remember it’s easy to volunteer, just leave a message on the Graves parkrun Facebook page or e-mail the Graves team on: graveshelpers@parkrun.com or See our volunteer page for details on getting involved in making Graves parkrun happen. 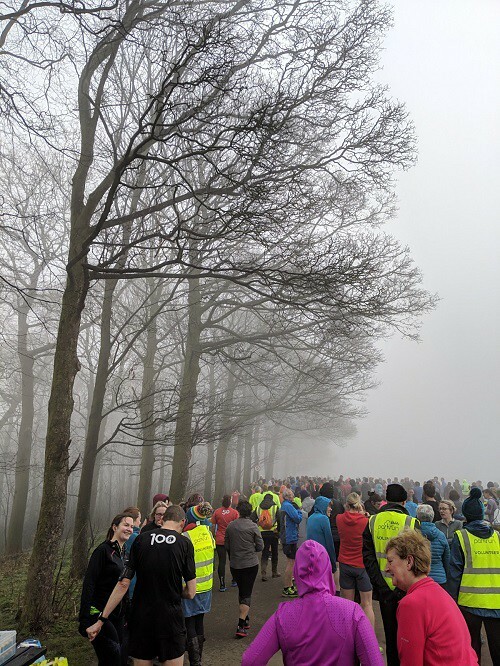 A total of 323 runners and walkers turned up to join in at a beautifully misty Graves Park this morning. We were expecting sunshine but the mist just added to the atmosphere and left a little bit of mystery about the course for those people here for the first time or as tourists from other areas. Jo gave us a pre-race brief in the fresh February air. 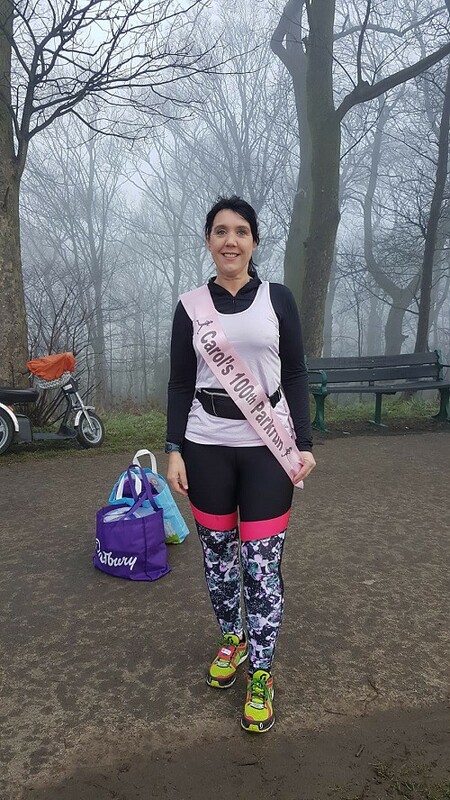 Carol was amongst those runners completing a milestone today. 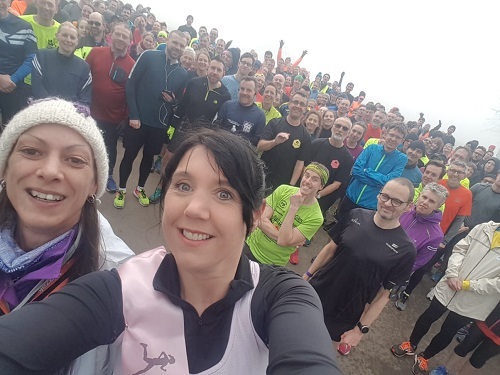 She ran her 100th parkrun and got a selfie during the pre-run briefing to celebrate. Big congratulations to her and all the others with milestones this week. One thing I love about parkrun is that after finishing it, so many people hang around to cheer on those still taking part. This is particularly welcome at Graves with the sting-in-the-tail hill right at the end. As always, plenty of people were there to cheer on everyone in their last glorious efforts just prior to crossing the finish line. A big well done to today's highest age grade, particularly as a junior runner! Join us again next week for more lovely parkrunning. Who knows what the weather will have in store for us...we love a surprise! Remember too: Junior parkrun at Graves takes place on Sundays. 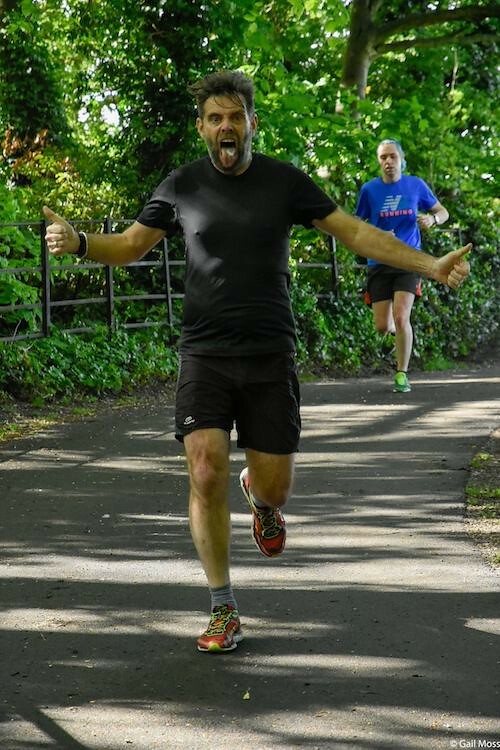 Thanks to Mike Jones for this week's run report and photos. With the weather having taken a turn for the chilly during the week, there was much chatter on social media as to whether this morning’s run would be on or not. Step forward Green who ensured nothing would get in the way of him checking the course early enough to provide an update with an hour before our start time. The all clear was given to lots of “likes” on facebook and everything proceeded as planned. There were 6 new to parkrun parkrunners today, we hope you enjoyed your first event and look forward to seeing you again soon. A further 24 people were visiting Graves for the first time. There were 4 Milestone this week, Gabriel ARMITAGE and Jordan HOWARD both joined the Junior 10 club. Lucy COWELL and Katie JACKSON both now eligible for their 50 t-shirts Congratulations from everyone at Graves. There were 23 PB’s this morning. Well done everyone! Please keep an eye out on Facebook for any cancellation notices before heading to Graves, we will always try to let people know as early as possible of any issues, but the safety of those taking part will always be our priority! Before we get into this report please allow me to preface with the fact that the journey to Graves was certainly an eye opener. We all know the joys of using GPS and when we think we know the route that we are going to be taking and yet somehow the magic google lady ends up taking us up and over the Snake Pass! I genuinely was not expecting that but it certainly highlighted to me what a beautiful part of the world we were heading to over in Yorkshire! The reason we were taking the trip all the way from Preston to this lovely parkrun was as part of the “Staying Alive challenge” which for the uninitiated is the task of completing three parkrun's beginning with a B and three beginning with a G. Who knows maybe our 38 first timers from this week might decide to venture out and try to complete this (or even some of the other challenges!) but even if not you have cracking parkrun right here at Graves park! 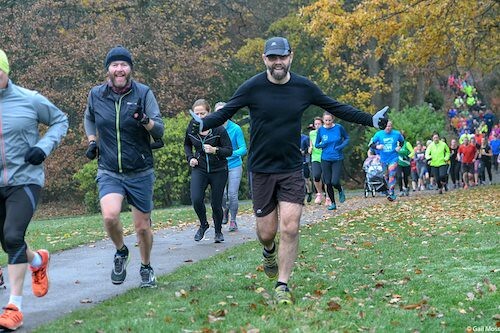 While we’re on the subject of first timers please allow me to say a MASSIVE welcome to the parkrun family, trust me stick with it and it will change your life VERY much for the better. 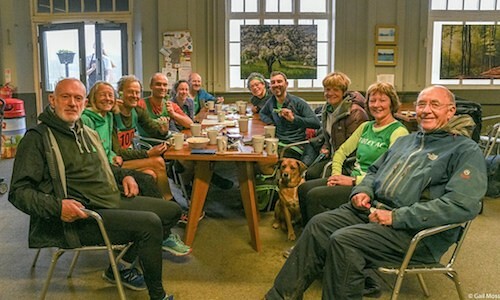 Although not a first timer to parkrun it was my first time at Graves parkrun so as is tradition we gathered round for the first timers briefing with Martin who explained the course to us. 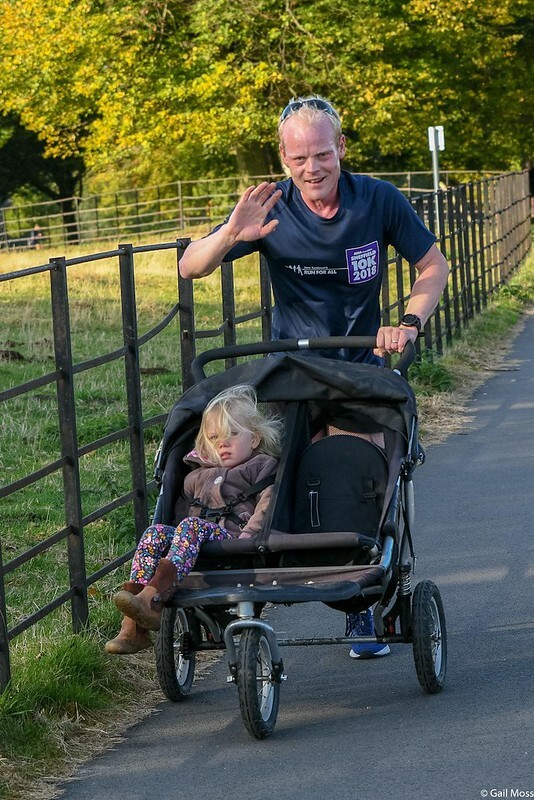 Already my partner in crime had been told that we might not quite be in the right place for a PB course but after all parkrun isn’t about times! It’s all about getting out there and enjoying a run/jog/walk with likeminded people around the absolute gems of parks which are dotted all over the country (of which Graves is definitely one!) With the course explained and everyone knowing what to do at the finish line (TOKEN + BARCODE = FINISH TIME) we were off to the full run briefing. 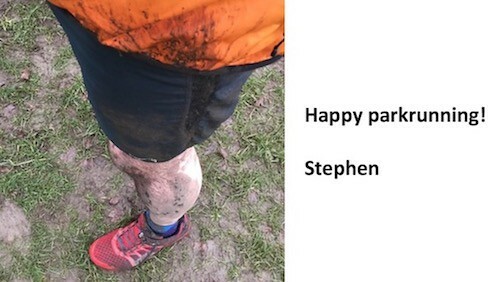 Having performed this traditional parkrun ritual of celebrating all those who had done something to celebrate in parkrun terms, whether that be dragging yourself out of bed for your first run or coming along for your 411th (WOW Lizzie Wilkinson) it was time to get the show on the road. The beginning of Graves could certainly deceive those who have not read a course description as after the flat first straight we were off DOWNHILL with some of our faster runners really going for it and hammering it as we turned the first corner and headed downhill. 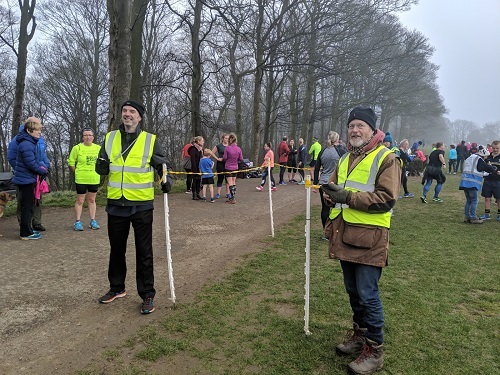 Waiting at the bottom was one of the true heroes of parkrun in full hi-viz gear with a smile and a well done at the ready to coax us all on! 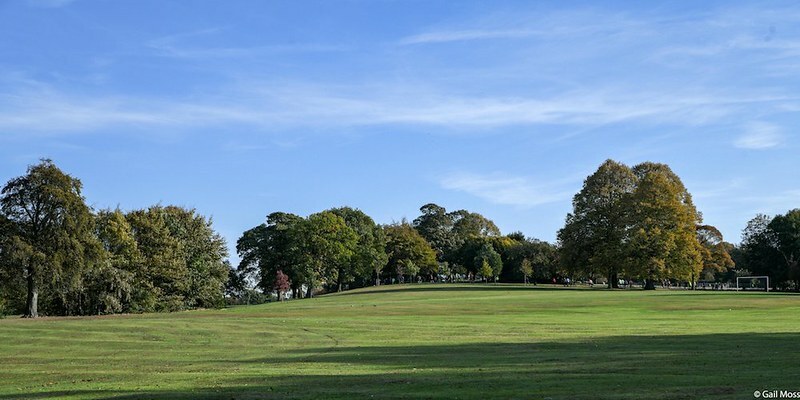 As everyone knows though what goes down must come back up (I’m sure that’s how that saying goes) but the wood lined paths of Graves park are so lovely to run through that the extra pain of running up hill was negated. After more woodland running we were off around the edge of the field we were soon running through farmland and past some of the usual wildlife where some of the volunteers were even willing to pose to get their photo into the Run Report. Let us just say I’m glad that all of the subjects of this photo are more photogenic than me! Soon after we were heading through familiar terrier and could see the cafe coming not far away in the distance.But wait! The run briefing definitely mentioned a lake and prior to finishing our first lap we were off around it! Knowing that the second lap was going to be shorter was definitely a bonus though and the pace quickened as we came around the lake. Much thanks to the lady who was keeping a very similar pace to me for giving me that extra bit of a reason to push on! Having lapped the lake we were then headed back around the field and could see Graves army of volunteers cheering us in. After that it was a simple matter of heading off for another lap around Graves park cutting out the lap of the lake this time with plenty of cheering and thanking of volunteers as per standard procedure for so many on a Saturday morning. 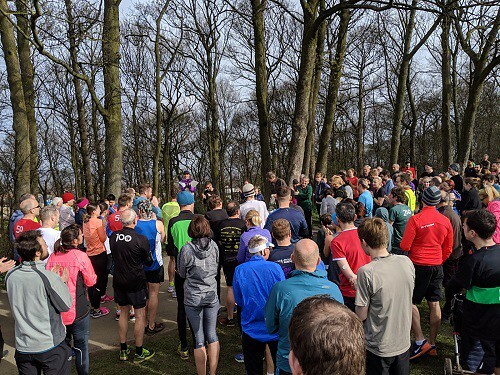 Graves parkrun you were absolutely brilliant and next time we are in Sheffield it’s going to be a very difficult decision between coming back and trying out another of Sheffields no doubt fabulous parkrun's. 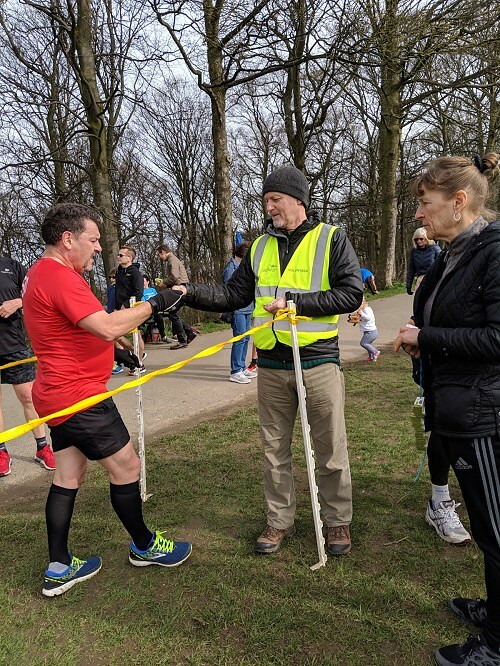 Thank you very much for being such wonderful hosts and know that I now have your parkrun on my list of DEFINITELY DO AGAIN! Representatives of 28 different clubs took part. 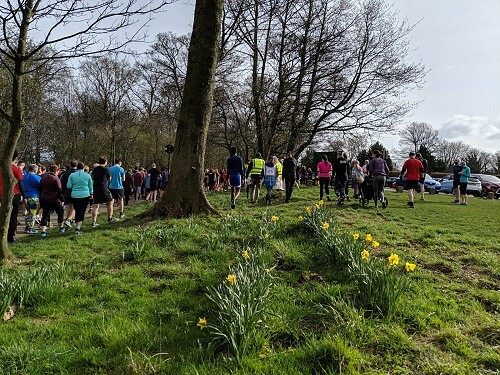 Today's full results and a complete event history can be found on the Graves parkrun Results Page. The female record is held by Lauren DAVIES-BECKETT who recorded a time of 18:44 on 21st June 2014 (event number 115). The male record is held by Joseph NEWMAN-BILLINGTON who recorded a time of 16:19 on 1st September 2018 (event number 323). The Age Grade course record is held by Yvonne TWELVETREE who recorded 90.48% (23:27) on 19th August 2017 (event number 274). With the colder weather being well and truly here, please keep an eye out on Facebook for any cancellation notices before heading to Graves; we will always try to let people know as early as possible of any issues, but safety of those taking part will always be our priority! 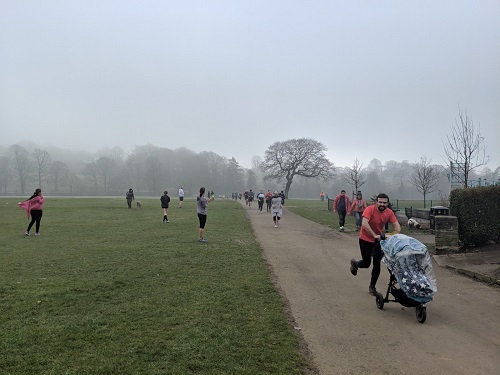 Don’t forget that there is a junior parkrun at Graves Park on a Sunday morning too. Thanks to Ben Smithers for this weeks report, if you fancy contributing, get in touch! 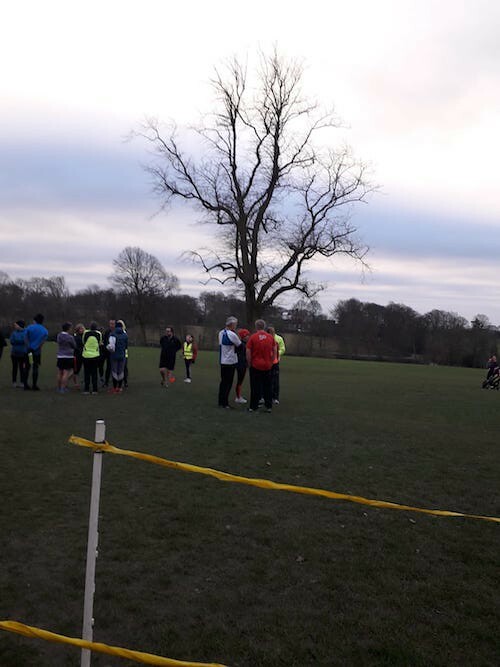 A crisp, dry winter morning greeted 330 runners, joggers and walkers at Graves for parkrun #342 this morning. Jo, nobly standing in for Catherine (who was otherwise occupied with her son’s chickenpox!) greeted the crowd and took care of the usual briefing. Runners were especially reminded not to duck the funnel as this really does mess up the results of everyone coming in afterwards, and to remember that parkrun is A RUN, NOT A RACE! Volunteers were thanked and enthusiastically applauded: well done and thanks to everyone who wrapped up to scan, marshal and cheer on the runners and walkers on a chilly morning Elaine BIRD, Stephen BIRTLES, Magdalena BOO, Cath DAVIES, Jo ECCLES, Harriet EISNER, Joe 'the Pirate' ELLIS, Tony ELLIS, Stephen GILMER, Emma GOODLIFFE, Chloe HENSHAW, Ruth HOFFMAN, Jane HUGHES, Kat JONES, Charlie LAST, Kerry MARSTON-GIROUX, Ann-Marie MULVEY, Dan MURPHY, Catherine NEEDHAM, Gavin NEWHOUSE, Robert NICOL, Stuart ROOKER, Amelia SANDERSON, Neil SCHOFIELD, Megan SMITH, Kate TETLEY, Amanda TOWERS. 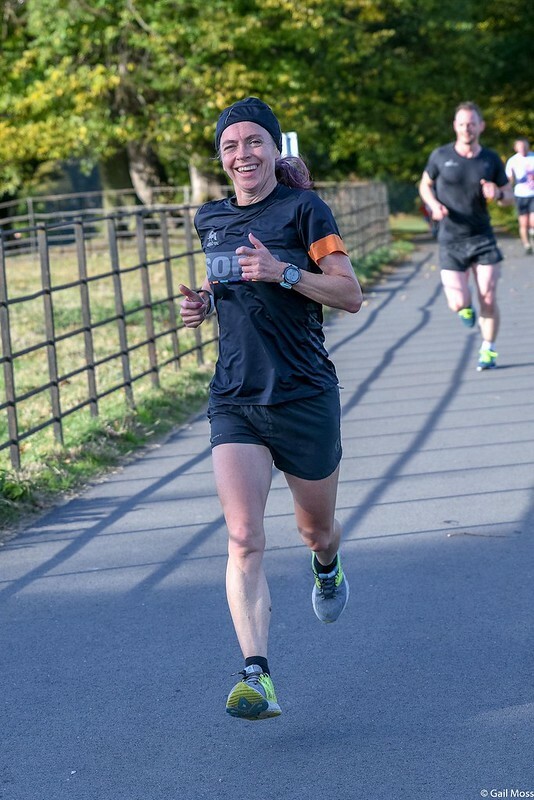 A special well done was given to Sara Hinch, who was running her 50ththis week. First timers and tourists were encouraged to make themselves known; however, it seems that most chose to keep a low profile…there were only one or two shout outs from the 25 people doing their first run at Graves today. One visitor from Peterborough was brave enough to make himself known; however, a peek at the results page revealed runners from Barnsley, London, Beeston and South Africa! Welcome to Graves, everyone: we hope that you enjoyed your visit today and that you will be back with us again soon. There were an amazing 24 people doing their first ever parkrun today. 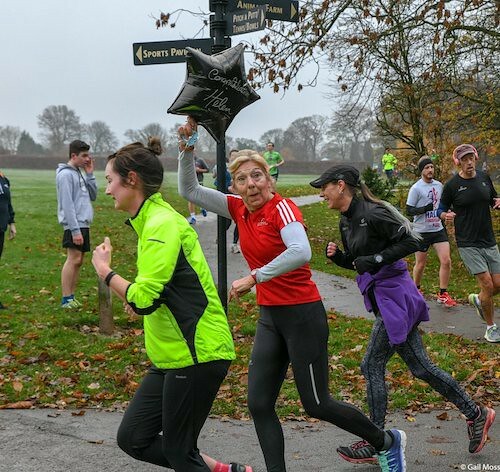 It’s great to see so many giving parkrun a try and remember, it’s not just for January! An incredible 31 runners were able to bag a PB today, in spite of the high turnout. Good work everyone! With the New Year well and truly with us it’s worth remembering that, as well as chasing PBs, there are some other running resolutions worth keeping in mind. 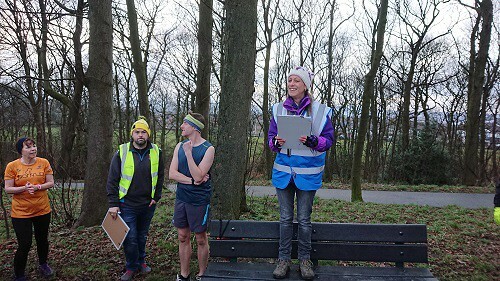 Parkrun is a true community event and entirely staffed by volunteers so making a resolution to volunteer to support your local parkrun should be on everyone’s list at this time of year. 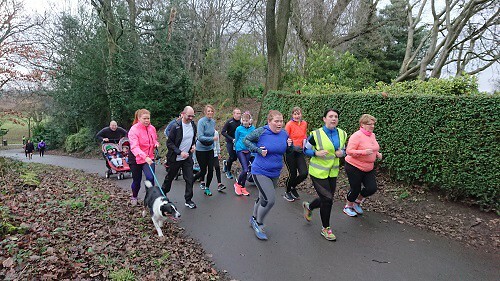 For more experienced runners, taking a place at the back to run with a new or returning runner once in a while is a great way to ensure that parkrun is accessible to everyone and to support the running community. Ending 2018 on a Volunteer High! What a way to finish the year… A full complement of volunteers and an epic 299 participants! Congratulations to everyone who came and a big thank you to this week’s heroes. 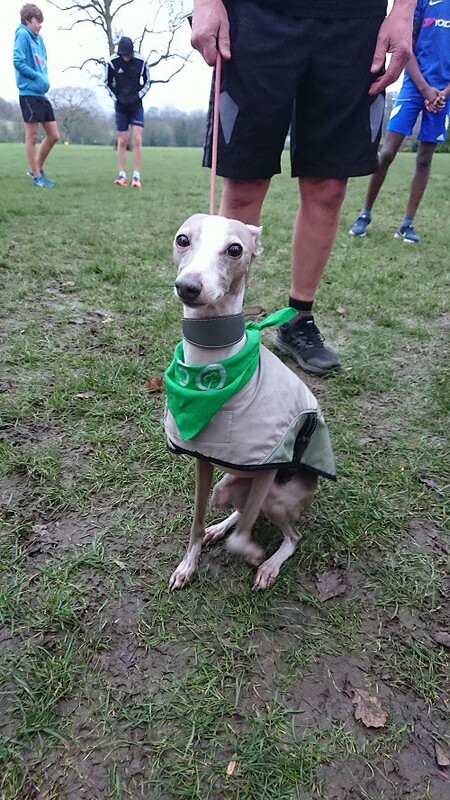 Jo kicked off run #340 with a big cheer for the volunteers, a reminder that dogs are welcome on a short lead held in their owners’ hands and that responsible adults must be looked after by their under 12s until the sprint finish. 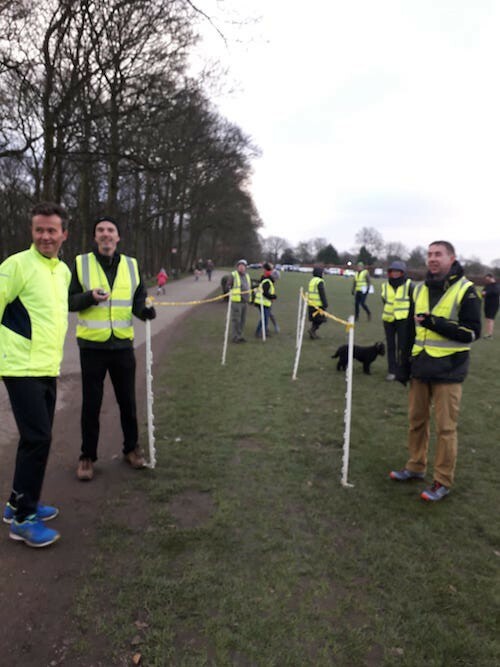 More practice is needed by us all when we join in to say “it’s a run not a race” but festive spirits and good will to all park users was evident throughout the event. This included well-travelled friends from Adelaide, Connecticut and Pittsburgh. 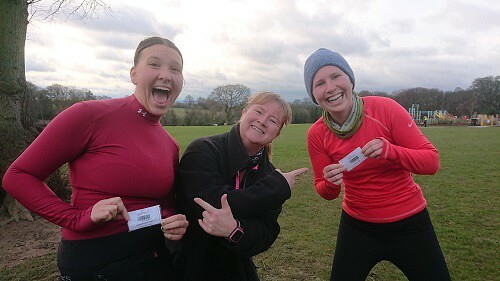 Our legendary ladies from the USA have truly done the Sheffield Parkrun Tour: after a quick sleep on landing, they registered and ran at Concorde then volunteered at the Graves Junior Parkrun. Following that they did the Christmas fancy dress at Endcliffe, came and met the highland cattle at Graves Park today and in between have completed the Longshaw Trust 10km. We may yet see them in the New Year so be sure to say hello! This week we had many milestones to celebrate. Alex SULTER for his Junior 10thrun, Alex HODGSON and Nathan BABIKER for their 50thand a special shout-out goes to Simon NIGHTINGALE and Lily THE WHIPPET for their 250thrun, and Simon’s 25thvolunteer! It was a blustery run today and I have to give a huge shoutout to the dynamo Dads pushing prams. It still resulted in 30 PBs! Congratulations to you all. 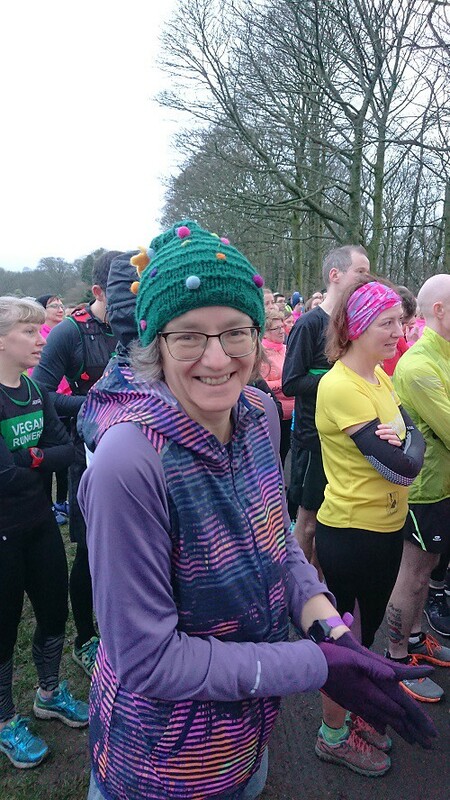 Judy JOHNSON (VW65-69) of the Vegan Runners Running Club had this week’s top age graded result with 27:40 (76.69%). Here are this week’s finishing positions. Congratulations to all of you. 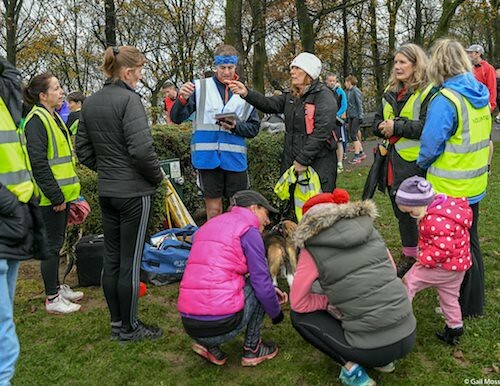 Many people choose participating in Parkrun as a resolution, but how about something different… could you recruit someone who wants to make new friends to become a regular volunteer? Could you bring visiting family and friends as volunteers? Many marshals bring their own chair to sit and cheer from, or there are a variety of roles you can do as well as participating. From timing and scanning, to sorting and cheering, there is something for everyone to do and I can speak from experience that it is theway to make friends. Keep checking facebook for weather updates in case of cancellations and remember to dress appropriately for the weather. Junior Parkrun continues on Sundays, otherwise I’ll see you all 9am on Tuesday for the New Year’s Day Parkrun. Gav was on the bench this week delivering the race briefing with his usual gusto. He welcomed all 329 of us to Graves (our 4thhighest attendance, possibly influenced by Rother Valley not running this week) and soon had everyone cheering for this week’s volunteers… Amy ALLCARD, Julie ARMSTRONG, David BONNETT, Keith BUTCHER, Janet CHAPMAN, Paul CHAPMAN, Alison CHILVERS, Martin DOWNHAM, Jo ECCLES, Lynn FINDLAY, Emma GOODLIFFE, Stephen GILMER, Everything's Run GREEN, Paul HIGGINBOTTOM, Jon HOWSON, Sue HUTCHINSON, Alison KANE, Charlie LAST, Jill MARSTON-GIROUX, Peter MOXON, Catherine NEEDHAM, Gavin NEWHOUSE, Conor O'BOYLE, Gillian RAY, Francesca ROOKER, John TOSCANO, Tom VALENTINE, Roger WALTERS. 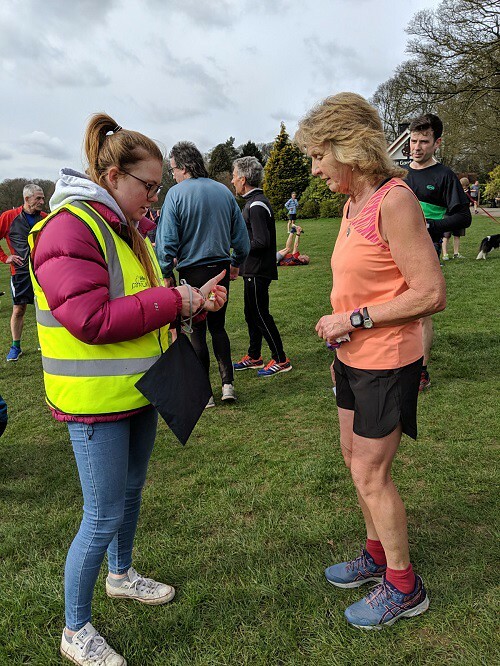 We then had the customary barcode competition between each side of the park, the introduction of the volunteering whiteboard allowing you to sign up there and then for the following week, and lastly a very important reminder that our tokens are essential to the running of the event. 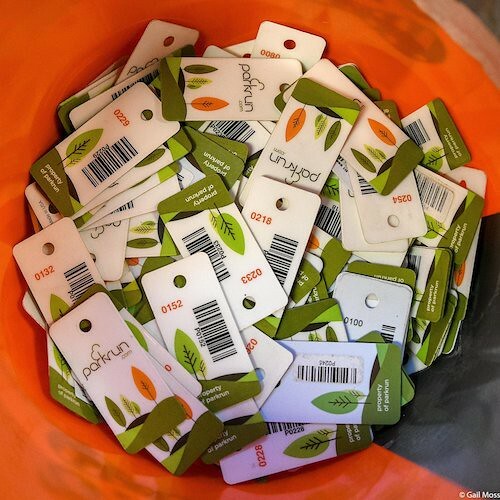 They are not accessories or suitable for jewellery, of course we’d love to see you utilise your own barcode how ever you’d like, but please ensure you give back the finishing tokens after you’ve had it scanned. 101 is a particularly popular token and we’re now on our 4thor 5thincarnation. Gav finished off with a very tuneful request for everyone to make their way to the start line. There were 14 new to parkrun parkrunners today, we hope you enjoyed your first event and look forward to seeing you again soon. A further 37 people were visiting Graves for the first time. There were plenty of Milestones this week! Firstly a big congratulations to everyone at Graves Junior parkrun on celebrating their 2ndBirthday! 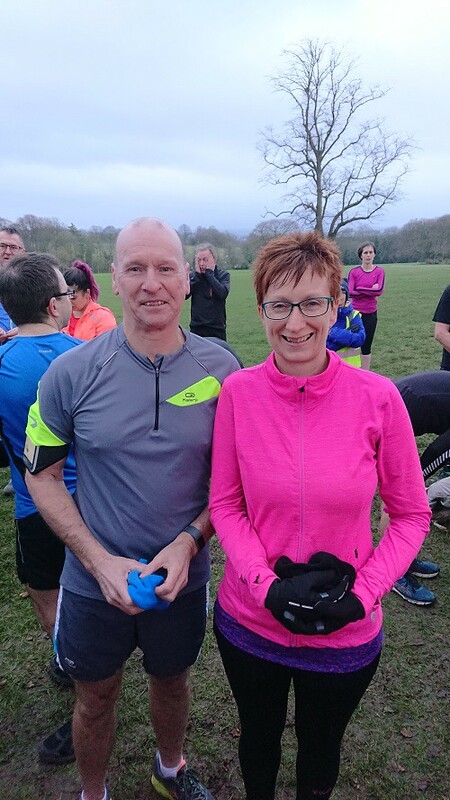 We had cheers for Paula Risby, Mark Norman and Joanne Hadfield for reaching 50 parkruns, Liam Whitby and Jeremy Brayshaw on 100 (Roger Walters on hitting 150 volunteering stints at Graves) and finally Helen Eberlin on completing her 250thparkrun! Awesome achievements by everyone, congratulations from everyone at Graves. There were 41 PB’s this morning. Well done everyone! Please keep an eye out on Facebook for any cancellation notices before heading to Graves, we will always try to let people know as early as possible of any issues, but safety of those taking part will always be our priority! Special thanks to Gail Moss for this weeks photos. Another special shout to Green for rescuing this weeks results with a safety pin after the stopwatch connection broke, could be a member of another A-Team if he wanted! 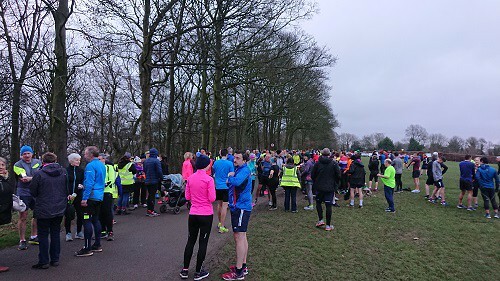 176 of you hearty folk turned up in some fairly cold and miserable weather… ‘Autumn's’ here’ was one parkrunner’s Strava title! I was unfortunately struck down by Norovirus so this will have to be a photo-less and stats only report – many apologies! There were 21 first timers this week, 8 of these were doing their first ever parkrun. Well done to you all. 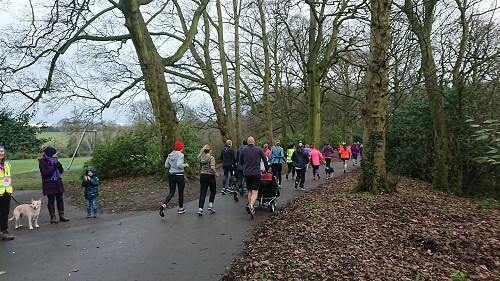 We had 13 people visiting Graves parkrun for the first time. Come back soon! 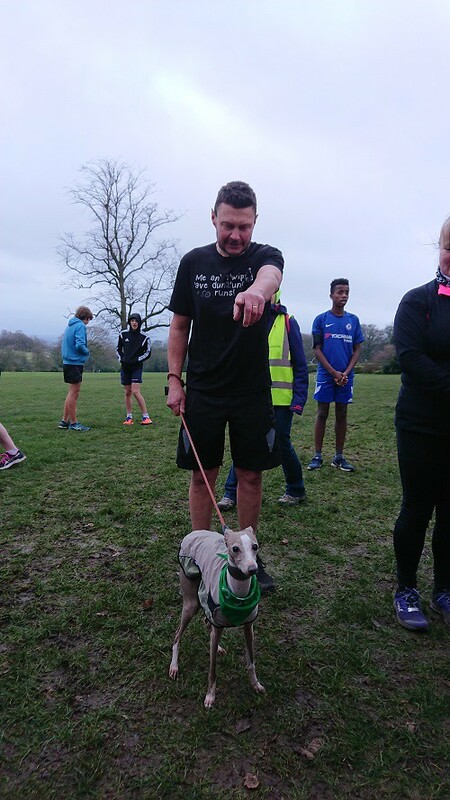 Jo was RD this week – very fitting that our Event Director led this morning’s parkrun for the 14th birthday of parkrun’s existence! We had three milestones this morning. Congratulations to Jane GARDINER and Mike LEIGH who both reached 50 runs and to Howard SALT who reached 100! Well done all! There were 34 PBs this week. Well done. The top age graded result this week was Oliver HART (VM45-49) with 18:31 (77.77%) Who incidentally was Graves parkrun’s founder! Great day to do this Olly! For those who don’t currently receive the volunteer e-mails, if you follow the ‘manage my profile’ link in your results e-mail, you will find an option to ‘opt in’ to the e-mails. We won’t bombard you don’t worry! Well, not unless we’re really desperate! 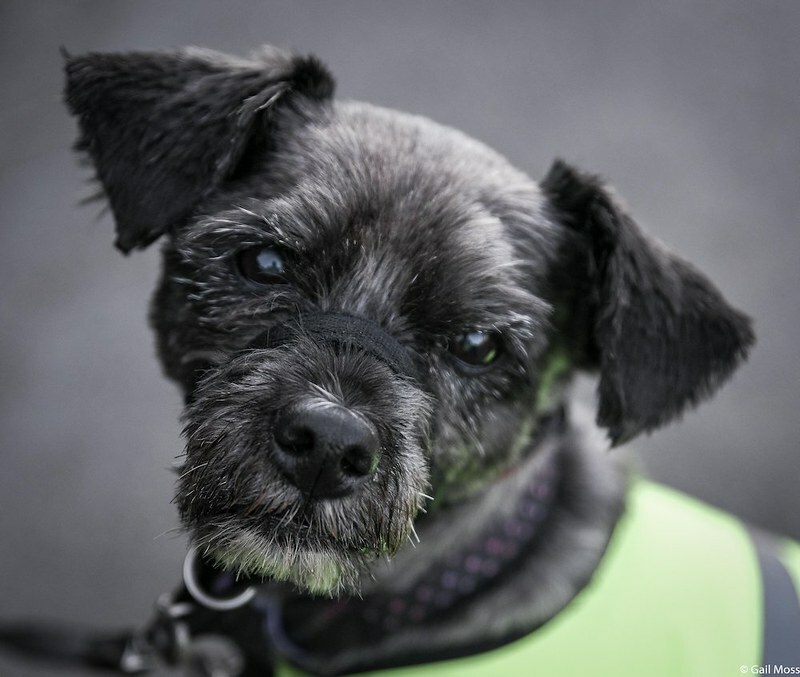 We are still running the doggy detour up the field but there are plans afoot to come up with a course which doesn’t not involved a potentially lethal run up a muddy hill! Watch this space – more details to come soon! Gav was on perfect form this morning welcoming 263 participants to Graves parkrun number 327. In a break from tradition he challenged those at the front of the crowd to “Show Us Your Barcodes” in competition with those skulking at the back. There was no such change whne it came to ensuring that this weeks volunteers got a big round of applause. Thanks to everyone who came along for the social run/walk new course trial spectacular tonight. Generally positive vibes in terms of variety, views, and general difficulty level. I've got an idea where a tweak can be made to one of the laps, which may be able to sort all those. Watch this space. There were 13 new to parkrun parkrunners today, we hope you enjoyed your first event and look forward to seeing you again soon. A further 7 people were visiting Graves for the first time. There were 4 Milestones this week, Katie MELDRUM and Maxine WHITWORTH both joined the 50 Club. 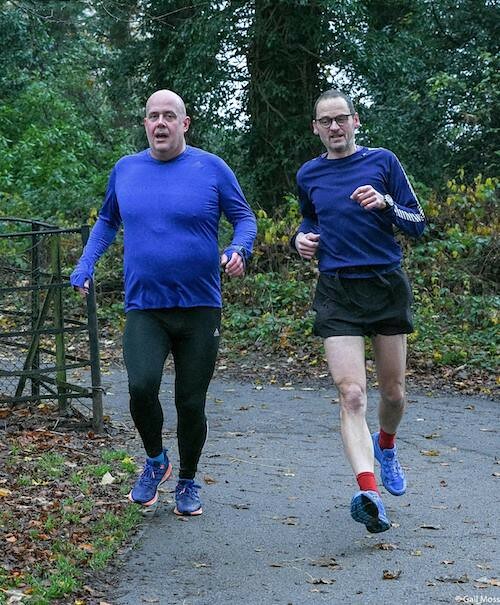 Robert CASSY and Paul MILLEN both reached their 100thparkrun. Congratulations from everyone at Graves. 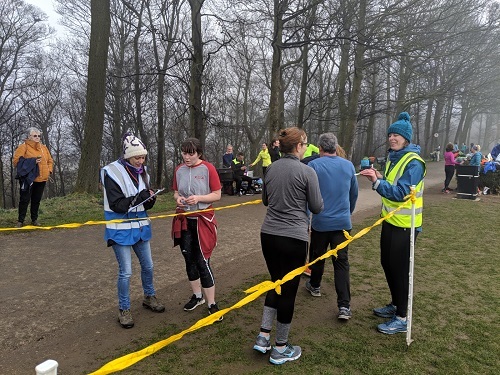 Shout out this week to Margaret Duncan for becoming the first lady ever to complete the Sheffield Way Relay solo, 50 miles, that’s about 16 parkruns back-to-back! Well Done! There were 44 PB’s this morning. Well done everyone! The doggy detour is still in full effect. The One Where One of the Brand New Tokens Went AWOL!